Roots on the Roof creates a communal space that celebrates sustainable and just food systems through healthy relationships with food, each other, and the land we live. We are a 100% student-run club that manages the rooftop garden space and the community garden plots on the roof of the AMS Student Nest, the Student Union Building at the University of British Columbia. Founded in 2014, we are focused on creating community-minded experiences and opportunities for personal empowerment that also incorporate concepts of food justice and food security. We facilitate student and community capacity around food by producing food as sustainably as possible, and by hosting events and workshops that encourage interactions around food, culture, health, and sustainability. By engaging with UBC’s diverse community, we hope to provide an avenue for knowledge sharing that enables dynamic ways to approach food system issues. To create an inclusive space for social engagement and opportunities to explore, learn, and actively take part in food system initiatives. Located on the rooftop of the AMS Student Nest, accessible from the 4th floor of the building. Main garden has 192m² of gardening space, enclosed by a fence; food grown within the enclosed area is for grown for sale to food outlets and the community. Community garden has 5 communal garden plots that exist outside of this fenced area; food grown within the community garden plots are reserved for use by club members who have signed up for a community garden plot. Our story begins with another garden: The Orchard Garden is a student-run teaching and production garden used by the Faculty of Land and Food Systems and the Faculty of Education, located beside the H. R. MacMillan Building for close to a decade. However, it had been operating on a temporary permit on land slated for development by UBC, and was scheduled for removal once construction began. 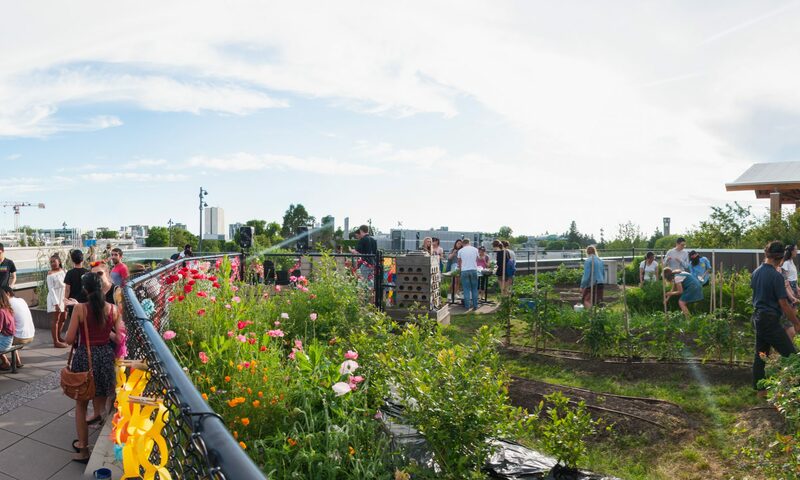 As a result, UBC offered the Orchard Garden space at Totem Field, and the AMS offered them one on the roof of the newly constructed AMS Student Nest. In 2014, the Orchard Garden was successfully moved to Totem Field, but the remaining space atop the Nest was still in need of someone to manage it. It was decided that in order to manage the new space, a new group would be formed. To form this new group, The Orchard Garden approached an experienced LFS student with a passion for using food systems to bring people together and create community. The student gathered a group of other like-minded students, and together they founded the club that would eventually become Roots on the Roof. For the next several months while the AMS Student Nest was finishing construction, the group planned out the garden and the club. They envisioned a future where the garden could become a community hub based around food, where they could grow produce, offer workshops, host events, and create fun projects for all. Beginning in the April of 2015, the club was able to head up to the rooftop and begin working on the garden for the very first time, and by the time it was June, the AMS Student Nest and the Rooftop Garden were officially opened to the public UBC community. Since then, the club has continued striving to create healthy relationships and spaces grounded in food, gardening, and community. This includes various projects, workshops, and events that focus on art, food, and gardening, from hosting jam-making and canning workshops to organizing a communal rooftop lantern festival! Now, our story continues with the ongoing support of the wonderful volunteers, members, and many other friends we’ve already made and look forward to making along the way!